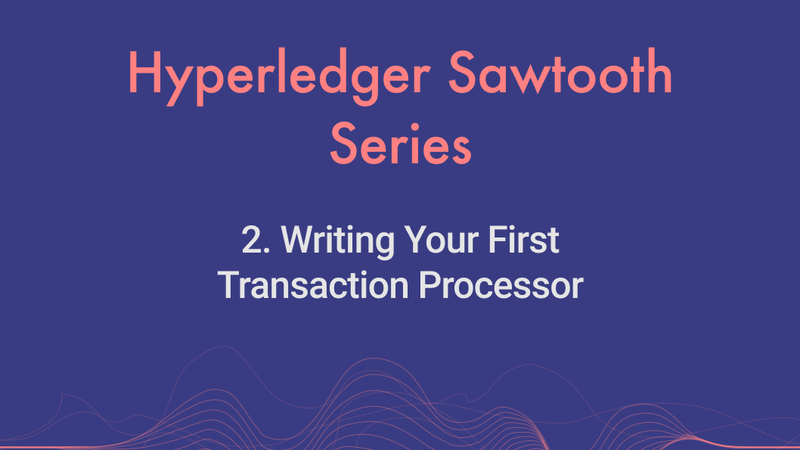 Now that you’ve some basic understanding about sawtooth (hope the previous one was clear enough to give some clarity) and also having a sawtooth network up and running with one validator and one Rest server, in this part of the series we’ll create a simple transaction processor that will be able to create and write data to the ledger. What is a Transaction Processor? 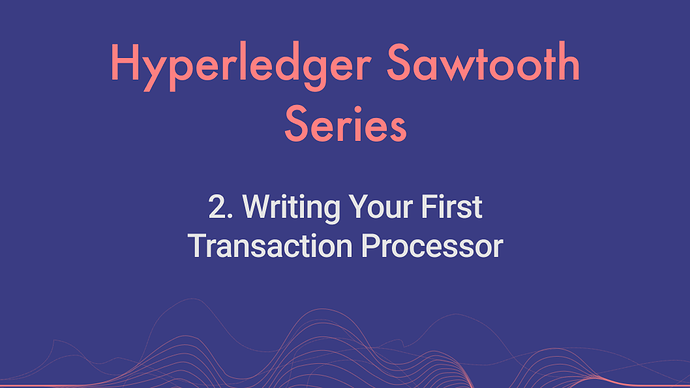 In Hyperledger Sawtooth, Transaction Processors (Usually called as TPs) are the smart contracts which governs the entire data. It consists of our applications business logics and the validations. Each time when you have to invoke some actions in the transaction processor, you need to submit a transaction with some payload. We’ll use that payload to decide what to be done and how it has to be done. Ways to write a transaction processor. Luckily sawtooth provide almost all the programming language support for writing the transaction processors. So you don’t have to start any new programming from scratch. In this article, we’ll be developing the contract with the most popular language of recent times (NodeJS) for covering up the majority of the crowd. And also the same philosophy is followed in other languages as well so there is not a huge disconnect. In our sawtooth-kickstart folder, create a new folder and name it tp, this will work like the root folder for our Transaction Processor. Now initialize an npm project with the following command and fill the information during the creation process. 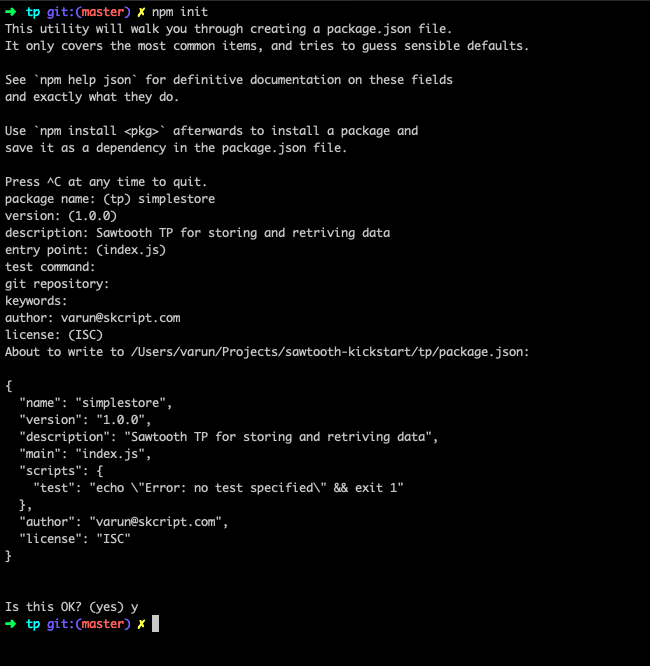 After creating you can see the package.json file where all the npm package informations are stored. Now lets install the sawtooth node SDKs for our project. Also we’ll install cbor library for encoding and decoding data. Now that the libraries are installed, I’ll explain the file structure so that it’s much clear when we go deeper. state.js - This is the important file where we manage all the state based operations. It works more like the model files in MVC applications. There is no convention to follow, but this pattern is well organized when you’re developing a large scale applications. After that we have to add an handler to the transaction processor with addHandler function on the transaction processor object, here the handler is imported from the handler.js file. Finally we’re starting the transaction processor with start() function. Running the index.js file will start the tp and keep listening at TCP 4004 port by default. Before getting into the handler, I’ll explain what all will be there in constants.js and lib.js since handler and state are dependent on it. Here we’re just having a function to hash a specific value. This hash will be used for addressing purposes by other functions. Hash function is imported here and as I said we’ll be using this for generating an address. Every Transaction processor will be belonging to a Family, and this can be anything we want to name. In our case I gave it as simplestore as we’re creating a tp for simply storing data. This family name is exported in the variable called TP_FAMILY which we’ll use in our handler. Also here we’re creating another value called the TP_NAMESPACE which is the address of the contract or TP. This is generated with the _hash function by hashing the Family name of the TP. Next up, let see what does state.js does. This is a crucial place since it handles the data layer. Here the context is the sawtooth data layer object which is used for setting a state value and also to retrieve any state value. For each TP, there will be using context. And the stateEntires is an object which is used like an container to set the state. This will contains the addresses and each addresses will have their data. This will be used to set the state, thus you need to add all the addresses to be modified or created as key and their values as well. In order to store data for a specific TP, we need to store it in an address that’s prefixed by the TP’s address or namespace. Thus we create function called makeAddress here, that takes an input and hash it to create an address prefixed with TP_NAMESPACE. Now lets create a function to set a value to ledger at a specific address. As the first step I’m creating an address with makeAddress function by passing the given value itself. Here we’re creating an empty stateEntries object and then adding the value for the corresponding address. When you store the value, you can only store buffer values and not direct strings. So make sure you encode it to buffer using Buffer.from(string). Finally call the setState of context with stateEntries as one params and timeout as another params. This will return a promise as it’s a async task. And similarly for getting the state with a specific address, you’ll use context.getState() by passing array of addresses you want to fetch. Thus finally the state.js looks like below. The handle is the very important file where the transaction is reached first and decoded to retrieve the payload and corresponding actions are executed. Handler file creates a class that is extended from TransactionHandler of sawtooth. We’re importing the State a SimpleStoreState and TP_FAMILY & TP_NAMESPACE from contants. Now create the SimpleStoreHandler that extends the TransactionHandler and in the constructor, we’ll call the parent class constructor by passing family name, the version and the address of the TP. In the apply function of our case, we’ve to do the following things. Extract the payload from the transactionProcessRequest object using cbor library. Based on the payload perform the corresponding state action. In our case we’ve either getState or setState in state class and in payload we’ll send the function as action attribute. Our payload will essentially look like below. Finally if the action attribute is not a valid one, we’ll throw an InvalidTransaction error which will reject the entire transaction and everything will rollback. Putting everything together our handler.js will look like. Now you’ll be able see that it’s getting connected to our validator. And in the docker logs of our sawtooth validator which the TP is connected to, you can see the below log. Now we’ve our own first sawtooth Transaction Processor is ready and up and running. In the next part of the series, I’ll be explaining how to code your client application to submit transactions. thanks for the series. It is very useful. Can you explain how to transfer a transactions? What exactly you mean by transferring a transaction? If we store different values in the same address, we can get only the last data stored in that address. Is there any way to get the previous data? You can setup ledger sync to retrieve all the data history of a specific address. That’s great. Thank you. Can you suggest me some useful links for that? Thanks for the great article and the sample code for developing Transaction Processor in Sawtooth. I have also been on Fabric past several months, and am now considering Sawtooth for my next project. Any insights from your end about moving from Fabric to Sawtooth for developing and deploying stable blockchain solutions would be very helpful. I am wondering how to implement the get API in your above example in Java if the apply method does not support any return value? Any pointers would be very helpful. Thanks again! npm WARN transaction@1.0.0 No repository field." Are you asking about how to retrive a data from blockchain ledger in sawtooth? Are you trying to install Sawtooth in windows? Thanks for the excellent post. when i am trying to register my TP, i am getting “Failed” as status. TP is not registered with validator. at the same time i dont see any error message in debug log. could you please suggest me any. below is my message. Can you please attach the entire log you get in the validator?